Under ESTHER Ireland’s Programme, the HSE facilitates Irish hospitals and other health institutions to engage in partnerships with similar institutions in less developed countries. This provides a mechanism for health staff to contribute to health needs in low income countries while continuing to be based in Ireland. This also provides an opportunity for health staff based in Ireland to learn from staff based in low income countries. Other institutions with partnerships fulfilling ESTHER’s quality criteria are invited to apply to join ESTHER Ireland by emailing: info@esther.ie. 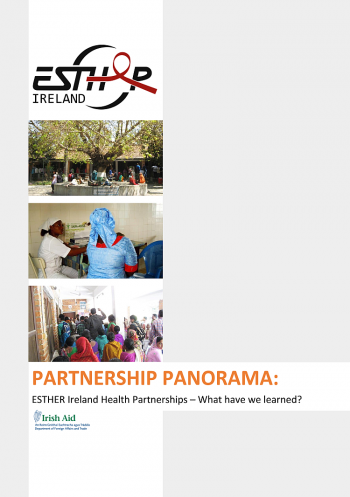 The case studies document, “Partnerships Panorama ESTHER Ireland Partnerships – What Have We Learned?”, was produced in 2016 and examines the partnerships, as well as the Small Grants Scheme. It distills key lessons, as well as outlining some of the features and principles of successful partnerships, and provides useful guidance for anyone thinking of undertaking international health partnerships work. Please click on the image to download the document in .pdf format.